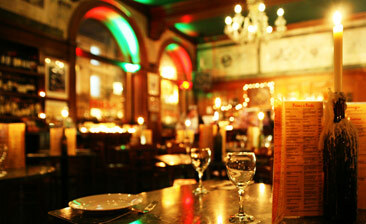 This restaurant has a great atmosphere and is usually 'buzzy' and lively. The surroundings are impressive with the high ceilings, marble fittings and wood panelling of the old bank still in place. The hard surfaces do tend to bounce sound around though, so it can be quite noisy. The food is traditional and I've always found it tasty and beautifully cooked. We ate off the 'daily menu' which is great value and offers a range of interesting choices as well old favourites. On this occasion the service was a bit slow and we had to attract the staff's attention a couple of times to make our order or get a drink, but they were very busy, and when they did attend they were helpful and friendly. Always recommended.